It is interesting and it’s changing so you have that constant inspiration to keep doing something new; you want that in your career. 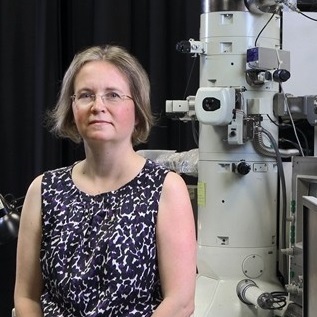 My name is Beverley Inkson, I’m a Professor of Nanomaterials, a nanomaterial is material which has got structure inside it which is on a very, very tiny scale. A scale so small that you can’t see it with your eye or with a microscope. It’s a scale which is very tiny but has a very powerful effect on how materials work and how they behave. If we can learn more about how materials are actually made at the nano-scale and how we can change how they’re made – it means we can change how they behave and make better materials and therefore better objects. This is the first time I’ve ever worked in engineering, there are many jobs that aren’t labelled engineering – but actually are. I didn’t do an engineering degree, I have never worked for an engineering company but I’m now working as a Professor of Engineering, it shows how you can come into engineering from many different routes because its so multi-disciplinary. When I was at school I didn’t know about engineering, nobody told me what it was so it wasn’t an option for me to choose. There are many more opportunities for young people now to learn about what engineering is and go to University to study a wide range of engineering subjects. Engineering is so broad that you can choose a subject that really interests you – from building a big bridge to working with the the tiniest of objects. At school I did science and maths and when I went to university I did a degree in natural sciences which covered a wide range of sciences, which is quite different. I really enjoyed doing materials science and physics so I ended up with a physics degree. I then did a PhD in Materials Science which was terrific – I learnt all about materials and how they work and how they can be engineered to be better, my PhD was sponsored by a Japanese company – so I got to work in Japan for a few months. I thought that was great, it really made engineering interesting that you could fly around the world to do your work. It’s so interesting and constantly changing; if you think about all the things that you have; you mobile phone, your computer, your car; they’re constantly being improved and made from different materials. It’s a very creative process designing new materials and improving the ones we’ve already got. Its interesting and it’s changing so you have that constant inspiration to keep doing something new. The key thing about engineering is taking materials and using them in better and smarter ways. It is very important to use less materials, less resource to be able to do the same job. This will be a big thing in the future and it’s essential because we don’t have much on the planet and we have to make proper use of it. I’m a Professor of Nanomaterials, a nanomaterial is material is something with a structure inside on a very small scale; a millionth the size of a millimetre; but it has a very powerful effect on how materials work and how they behave. If we can learn more about how materials are actually made, we can learn to change how they’re made. It is something that not many people have heard of but if you think about something like your mobile phone, the structure of it has been achieved by people doing engineering at the nano-scale; all of the wiring and things like that have been engineered by this very small nano-engineering to make more objects and more functionality into a much smaller space. When I did my degree I was one of five women out of 120 within my group, so I have always been outnumbered. But I’ve been outnumbered so long I don’t even notice. It is getting better, there are a large number of programs here at Sheffield to encourage women to come into engineering and there is no fundamental reason why women aren’t here, it’s always just been that there are more men applying. I’ve never had any problems other than I am outnumbered. How do we encourage more women to study and work in engineering? Engineering is not a school subject, so many women don’t have a good knowledge of what you can achieve and what you can do in engineering. It’s an excellent career and there’s such a variety of different subjects that you can do. When people are actually doing engineering, they love it. If you’re at school and looking at your choices the main thing is to make sure you choose something that interests you, but also keep an eye ahead on what you’re going to be aiming for. If you want to do engineering it’s a good idea to make sure that you have a broad range of sciences and maths, when you get to university there is not such a clear distinction between the subjects; they all merge into one another and you’ll be able to find the niche that really excites you. Engineering is so broad that you can choose a subject that really interests you – from building a big bridge to working on the tiniest of objects.